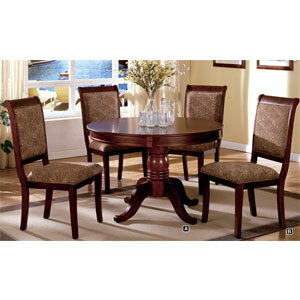 5-Pc Traditional Style Dining Table In Cherry Finish. This Set Includes A 48-Inch Round Dining Table And Four Upholstered Side Chairs. Additional Chairs Can Be Purchased Separately. Made From Solid Wood And Veneer. Strong Construction. Easy To Assemble.